You’re Invited: Celebrate ‘One Year To Go’ Ontario Games 2012 + Mascot Design Contest. Ontario’s largest amateur, multi-sport event is the 2012 Ontario Summer Games. By the way, the Winner of the Mascot Competition will be announced on 9 May 2012. Also, more than 1,000 volunteers are needed for the 2012 Ontario Summer Games. Stay tuned for updates on the 2012 Ontario Summer Games, including event updates. The Organizing Committee for the 2012 Ontario Summer Games is pleased to announce the 26 Games venues where 2,500 athletes will compete in 28 team and individual sports, as part of Ontario’s largest amateur, multi-sport event. 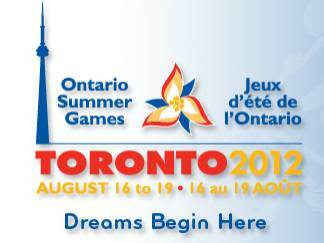 The City of Toronto is hosting the Games from August 16 to 19, 2012, with some pre-opening events on August 14, 15 and 16. Centennial Park and York University each feature three separate sport venues. L’Amoureux Park features two separate sport venues. “I am excited by the amount of progress made to date by our organizing committee. We have secured venues across the GTA and in St. Catharines and Welland that will provide an excellent experience for everyone involved,” said Rahul Bhardwaj, Chair, 2012 Ontario Summer Games. The Organizing Committee for the 2012 Ontario Summer Games worked with provincial sport organizations (PSOs) to select and finalize the venues, based on sport technical specifications provided by Sport Alliance Ontario. For most participating athletes, the 2012 Ontario Summer Games will be their first multi-sport experience. The athletes qualify to participate in the Games through a PSO selection process. Up to 3,300 participants in the 2012 Ontario Summer Games, including athletes, coaches, managers, officials and PSO representatives, will be housed in 12 athlete villages located in Toronto, Oshawa and St. Catharines. Many local universities and colleges will be used as athlete villages. Sports participating in the 2012 Ontario Summer Games are required to meet certain criteria and go through SAO’s sport selection process. SAO provided the list of sports that were successful in participating in the 2012 Ontario Summer Games to the Games Organizing Committee. To learn more about the Ontario Games program’s sport selection process go to http://www.sportallianceontario.com. The Ontario Summer Games began in 1970 as a showcase for amateur sport. They have now become the Province’s largest multi-sport summer event, including both team and individual sports. Up to 2,500 provincial level athletes qualify through a selection process conducted by Provincial Sport Organizations (PSOs). The Ontario Summer Games take place every two years and are awarded through a formal bidding process. A program of the Ministry of Tourism, Culture and Sport, the Games are being delivered in 2012 by SAO, in collaboration with the City of Toronto, Toronto Sports Council and Tourism Toronto. SAO, a provincial sport development agency, supports personal and community development through sport opportunities – from the Playground to the Podium. It provides programs, services and resources to help its member organizations achieve their own objectives and realize their full potential – enabling the full Ontario sport and recreation community to grow, prosper, succeed and celebrate. For more information on the Games venues, sport descriptions and qualification processes, volunteer registration and more, visit the Games website at http://www.2012ontariosummergames.ca.